When Reuven Mathler is hit in the face by a baseball lobbed by his opponent Danny Saunders, he expects to hold a long and bitter grudge. Instead, Danny comes to the hospital to apologize. Reuven accepts, and the two begin a deep friendship that is tenuously balanced on their differing families and beliefs. Reuven is the son of a professor and a follower of Zionism. Danny is being groomed to take over his father's position as a rebbe to the Hassidic people. As the two boys become closer, they discover that their lives are worlds apart in spite of living with just a few streets between them. I can't believe I haven't read this book before now. It's really beautiful. Potok writes wonderfully intricate characters. The characters in this book are so sure of their beliefs that when they fail them, they do not know where to turn. This book is especially poignant for those of us who have a religious upbringing. There comes a moment for each of us where we have to leave the faith of our parents behind. We either make the beliefs our own or we abandon our faith. Reuven and Danny are at this exact moment. Reuven is enjoying his father's new confidence in him and the adult conversations that they have about religion and world events. His new relationship with his father and his faith guide him toward becoming a rabbi. Conversely, Danny is expected to become a religious leader of the Jewish faith, but his father's distance and refusal to consider the relationship between psychology and faith cause Danny to question his beliefs and his future. I think one of the reasons that I related to this book so much is because I am the daughter of a religious man myself. Our family spent many evenings debating theology over the dinner table or being quizzed on obscure passages from the Bible. Obviously our quizzes were much less psychologically scarring and we have a good relationship with our father, but I understand that elation of making your father proud in the subject that he holds dearest. There is a bond created when you feel that a parent sees you as an intellectual equal and they give you advice that you will keep with you forever. For example, Reuven's father reveals to him that the distinction between things that are important and things that are frivolous is not as great as we think. "Reuven, as you grow older you will discover that the most important things that will happen to you will often come as a result of silly things, as you call them - 'ordinary things' is a better expression. That is the way the world is." This is a book to be read slowly, to be savored. Mr. Potok has written a lovely book about the moment when you begin to understand your parents and they begin to see you as adults. It's about the time when parents realize their limitations - the things they cannot do for their children, no matter how hard they might wish to do them. It's a novel about the truest kind of friend; the one who remains after a fight, after your world has fallen to pieces, the one who falls right back into place as if nothing had happened. This book will resonate with anyone who is a parent, anyone who has parents, and any person who is deciding what beliefs are really their own. I was excited to discover that there is another book about Reuven and Danny. Their friendship continues in The Promise. I am intrigued to see where Potok takes this very realistic and complicated relationship. 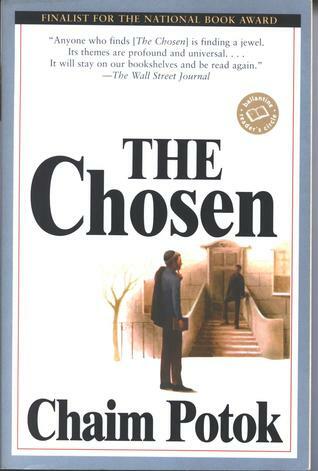 Have you read The Chosen? What did you think of it? I had to read this in school and I really enjoyed it. I've read a few other books of his and they are all great. That's wonderful. I am interested in finding out what happens to the boys in the sequel and I've heard good things about Asher Lev and Davita's Harp. I've never heard of this before. I do like books that contain discussion of religion - I'm married to a religious education teacher so we have a fair few discussions ourselves! Sam, sometimes I think we might be transatlantic doppelgangers. My husband is a pastor, so we have a lot of religious discussions too! This book reminded me in some instances of A Tree Grows in Brooklyn. I think the tone is similar and it has a sort of quiet beauty.